As soon as I took these pics of Gracie playing dress up (which is an everyday occurrence at our house!) I knew they would end up on a layout. She loves mixing colors and patterns, and that's what I did here too. I used the "Bayside High" June kit from the Paper Bakery that has lots of new Heidi Swapp goodies. Don't you love the sequin arrow!! I even added a bit of the packaging from the Vintage Chic Buzzwords. I just cut the b&w stripe borders off the front and back of the package. SOOOOO cute!!! The photos are adorable and the LO is just as wonderful!! :) Great job! so so cute Mary Ann! Ahh! This is adorable! I love the pattern paper AND that adorable ruffle. This is a gorgeous layout! I totally love this! Adorable! 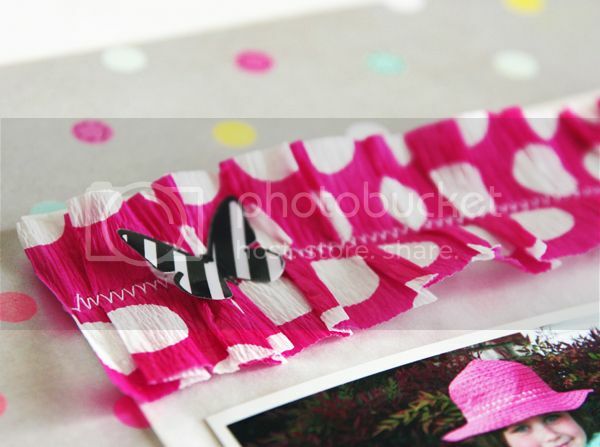 The hot pink crepe paper contrasting with the black and white elements totally pop. Love it! ADORABLE!! I love that polkadot streamer!! Those photos are awesome Mary Ann, and you created a perfect page to go with them!! I just love this layout and of course the fact that we both "saved" the bag and ruffle to use just cracks me up! I love how you used it on your layout!!! Nice layout! Love the colors and ruffle.